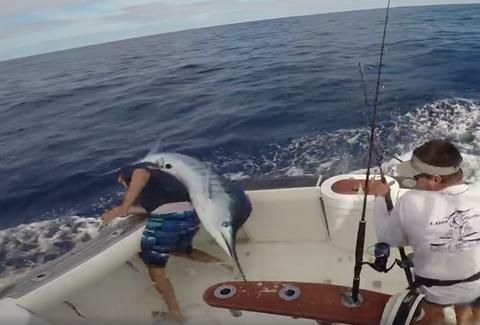 On a recent fishing trip off the coast of Australia's Port Stephens, a group of guys reeled in a helluva surprise when they hooked one marlin that did not want to be messed with. As seen in footage shared on Facbook (below), the nearly 200lb beast of a fish -- angry as hell -- flails out of the water and slams into Conor Cogan, almost sending him overboard and just narrowly missing him with its spear-like beak, according to a report by the Newcastle Herald. Some would say it's the first significant hit a Marlin's had since they traded Miguel Cabrera in 2007. Had a great day off Port Stephens yesterday on board " The Pump". Went 6-6-4 for the day and also had one come into the boat. Pretty much as close as it gets. Posted by Conor Cogan on Friday, January 1, 2016 According to the paper, the feisty fish escaped to live -- and fight -- another day. And one thing's for sure: this video's audience is definitely the most people who'll see a Marlin hit anything this year. Tony Merevick is Cities News Editor at Thrillist and just learned a lot about baseball, believe it or not. Send news tips to news@thrillist.com and follow him on Twitter @tonymerevick.